The species is widespread near the coast in England and Wales north to Yorkshire, and on southern heathlands and in south-eastern England. It is widespread in western and central Europe. 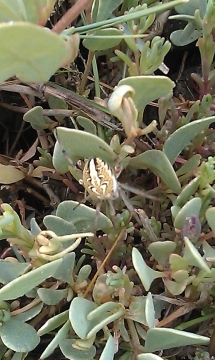 This distinctively marked spider spins its orb web on low vegetation such as heather, gorse and sometimes grasses in a range of open habitats including heathland, coastal grasslands, saltmarsh and fen. The hub of the web contains much white silk giving it an unfinished appearance. The retreat is a platform of silk on which the spider awaits its prey. Both sexes are adult from mid- to late summer, females through to the autumn. Generally an uncommon species becoming rarer further north. It may be locally common in the south and south-east.